Covered call writing involves options calculations…there’s no getting around it! It’s been a while since we talked math. What’s with all the frowns? Mastering and understanding the calculations (The Ellman Calculator will do all the work) will enhance our bottom lines…more cash in our pockets. With that in mind, let’s set up a hypothetical portfolio of 5 securities with a cash available reserve of $50,000. This represents a total investment of $46,291 leaving about $3700 for possible exit strategy executions. The beauty of this calculator is that it will assist us in making our investment decisions based on our market assessments and chart technicals. We must also factor in our personal risk tolerance (if low, favor in-the-money strikes). If we are bullish on the stock and overall market, we look to garner the highest ROO (return on our option) and upside potential (out-of-the-money strikes). If we are bearish or concerned in any way, we look to get the additional downside protection of an in-the-money strike. In the chart above, I highlighted in yellow the choices we would favor if we were bearish. We can generate a 2%, 1-month return with some excellent downside protection. I also highlighted in green, some bullish choices we would consider where the return and potential return of share appreciation are greater but with little or no downside protection of the initial option profit (time value of the premium). Please remember that downside protection in the BCI methodology represents protection of the option profit, not the breakeven. 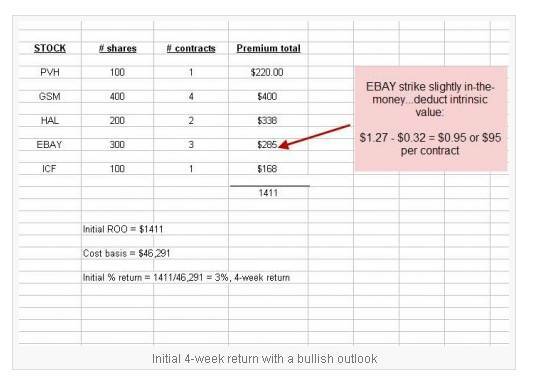 Note that for EBAY the strike was slightly in-the-money so we deduct the intrinsic value from the premium before calculating our initial option return. Once we have selected our stocks and sold our options and placed them in our portfolio manager (organized lists), we begin the process of managing these positions for possible exit strategy executions. This will not take a lot of our time. There is a learning curve to covered call writing but once mastered, it becomes second nature and a great way to invest and become financially independent for many Blue Collar Investors. 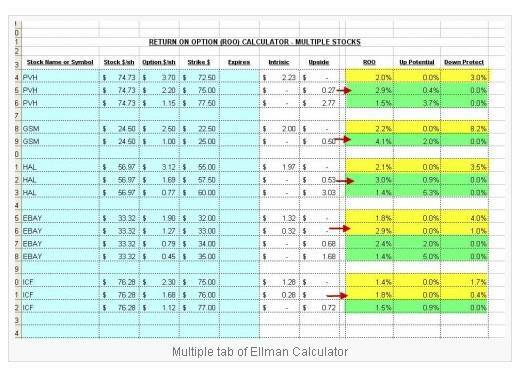 For a FREE copy of the Basic Ellman Calculator click on the “free resources” link at the very top of each of our site web pages. ***Because of you, our recent webinar in conjunction with The Money Show was a smashing success with a huge attendance and wonderful feedback. Thanks to all of our members whom participated. For the week, the S&P 500 rose by 2.2%, for a year-to-date return of 9%, including dividends. BCI: This site continues to have a bullish outlook but remains conservative in its investment approach until the “sequester” issue has been addressed. Global, economic and political events can disrupt a bull market even temporarily and so caution is appropriate in the eyes of this investor. As a result, despite our bullish stance we are slightly favoring in-the-money strikes in our investment choices. Your support and loyalty is greatly appreciated and never overlooked. When deciding on strike prices which factor is more important: chart technical analysis or overall market analysis? Thanks for all you do. Tough question because I consider BOTH important. Generally, overall market movement is the greatest influence on share prices but chart technicals cannot be ignored in my eyes. Since I consider myself a conservative investor, if either general market conditions or chart technicals are mixed to bearish, I will favor in-the-money strikes. This does not necessarily mean ALL ITM strikes but a greater percentage as I oftentimes will “ladder” my strikes. This week’s stock list has a significant number of choices. 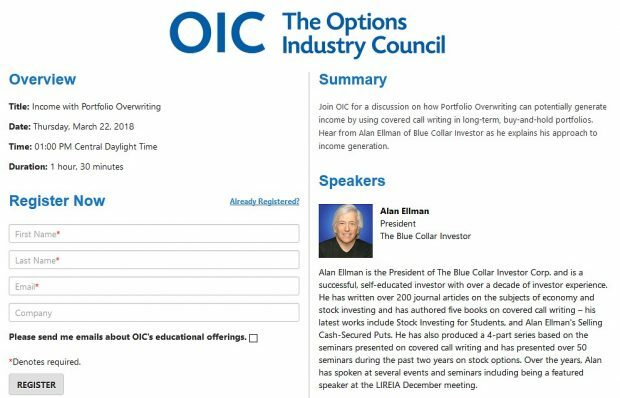 Do you find a relationship between the overall market and the number of stocks on the blue collar stock list? thanks a lot. ABSOLUTELY. We definitely have more eligible cc writing candidates when market conditions are favorable and that is because more stocks are technically sound. We are currently looking into using the premium running list as one of our market indicators. Thanks for helping average guy. The profit will be 7.40-7.37 = 0.3 cents. My question is how to refine my search for good ITM candidates. What is up with the quirk in the E Calculator? The supplement of the last post is an example where ABG stock price “$” clings to the number. That cell has a different formatting. Am I overlooking something? ps. do you place many buy-write orders? The dollar sign????????????? ?Any excel experts out there? 1- A much better way to teach this strategy to explain both aspects of the trade. 2- Most exit strategies involve using only one leg of the trade. 3- It allows use to leverage the “show or fill rule” when negotiating option prices. That being said, there is nothing wrong with buy-write combination forms when initiating or closing a trade and it may even result in a lower commission in some cases depending on the brokerage. In my books and DVDs both appropaches are explained in detail. i regret if I sounded fu$$y. i have just noticed that quirk doing calculations using The Elliman Calculator. 2, and 3 are very strategic reasons, thanks.